Start building interest in photography by taking the extra steps to share the photos you take and let your kids see what their photos look like as soon as they are at the right age. Be sure to add encouragement and compliments. Don't force your children to have their picture taken when their mood isn't there. Never get angry or scold them if they are resistant because they will remember the camera as the cause of getting into trouble. 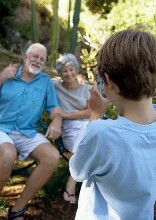 Be ready to start shooting when they are relaxed and enjoying the moment. Don't continue to try and get your children to pose if they are obviously not into it. Let them explore and get comfortable with the new situation and the surrounding area. Be careful not to force them into new clothing or hats or other things that may distract them until they are photo savvy and at that point, you can have them help you pick out what you might want them to wear for picture time. Have your camera ready, (battery in and charged, memory card engaged and any props ready and available) and your best attitude showing. Get down to their level and never pester them to go back and do something again because you may have missed a shot. No arm tugs or "stand over there and don't move" commands. Capture the NEXT wonderful and fun shot! Encourage them to ham it up and make faces to get it out of their system at the beginning and let them settle down at their own pace. You might enjoy those photos even more. If you have an average Point-and-Shoot Digital Camera or better, try the "kids & pets" type of setting and the "continuous shot" feature that automatically snaps off several shots for you and it will be easy to rack up enough photos for you to be able to choose and save and treasure the right ones later. Just remember to have fun and start building interest in photography today!